The Sheraton Tampa Riverwalk is a deluxe waterfront property offering a more intimate hotel experience in the heart of downtown Tampa. Located on the banks of the beautiful Hillsborough River and featuring direct access to the Tampa Riverwalk, overlooking the historical University of Tampa and Henry B. Plant Museum. The Sheraton Tampa Riverwalk Hotel features 277 beautifully appointed over-sized guest rooms and suites with the Sheraton Sweet Sleeper Beds offering a view of either downtown or the waterfront. Hotel amenities include our riverfront deck featuring a heated outdoor pool, direct access to the Tampa Riverwalk, complimentary high speed wireless Internet access throughout the property, complimentary fitness center and award winning River's Edge and Lounge waterfront dining. We have a fantastic selection of options to accompany your special event. Discover a relaxing oasis at the Tampa Marriott Westshore. Our hotel places you in the heart of the action in Tampa's bustling Westshore district, within walking distance of many attractions in Tampa. 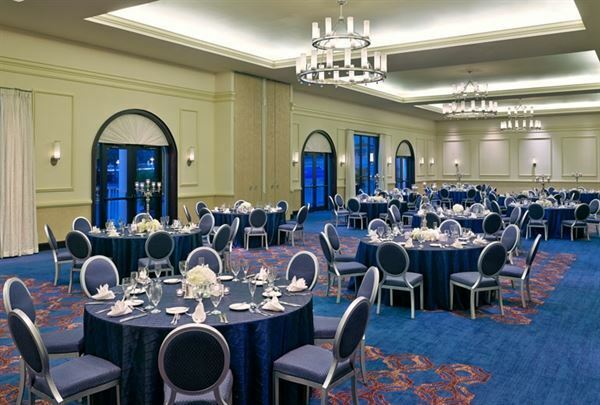 Those seeking the perfect destination for an event here in Tampa can make use of our hotel's versatile venue space and our expert planning services. Start your new life together in romance and elegance at the Tampa Westshore Marriott Hotel. Whether choosing a tropical experience on our outdoor patio or candlelit elegance inside our Grand Ballroom, our team is with you every step of the way, making all of your wedding dreams a reality! From intimate dinner receptions of 30 guests to elaborate receptions of 300+, we will create a special day for you and your guests from ceremony to reception. We can also assist you with your bridal shower, coordinating over night hotel stays, your rehearsal dinner and a delicious Brunch for your guests the morning following your Big day! The Florida Aquarium will be hosting a Wedding Tasting on August 8th, 2018, from 7 PM - 9 PM. We invite you and your fiance to attend this experience. Get a full view of our unique venue and taste some of our most popular wedding menu items to help prepare for your big day! Get more information and purchase your tickets by visiting flaquarium.org/weddingtasting. Imagine exchanging your vows in front of your family, friends and 2,000 coral reef fish. Say "I do" with our 500,000 gallon floor to ceiling panoramic window as your backdrop. Our event and catering professionals will help you create a truly unique and memorable experience. Introducing, the Event Center, a beautiful, all-inclusive, flexible venue to accommodate your every need for anything from a successful small business meeting, to a much larger event, like a trade show, a banquet or a wedding. With more than 10,000 sq ft of functional space, the Event Center is so much more than an impersonal convention center. The management and staff are experts focused on delivering each client’s individual wants and needs, to provide stress-free planning and precision execution of your special event. The Event Center is fully equipped to provide seating, tables, linen, audio-visual devices, catering, and cash bar options, with no up-charges or additional costs to the host. In fact, when it comes to food, you can personally cater your affair, sharing your very own delectables! ZooTampa at Lowry Park prides itself on unforgettable natural connections. Here, your event is an experience. Your guests can feed a giraffe, or come face-to-face with a manatee, while enjoying a carefully curated menu by our award-winning chef. Our proximity to downtown, and location within the historic area of Seminole Heights makes our Zoo a one-of-a-kind destination. The Zoo can accommodate everything from an intimidate wedding reception overlooking our African savanna, to a buyout for your company-wide employee picnic. Private venues are available for groups of all sizes. We specialize in convention groups and large receptions, corporate outings and team building, weddings, family reunions, proms, and sorority/fraternity formals.